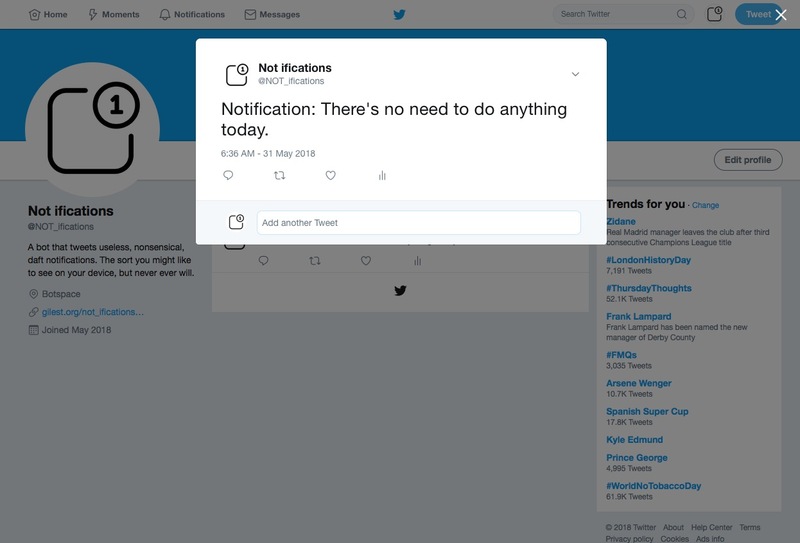 NOT_ifications is a bot that posts useless, nonsensical, anti-notifications as tweets. They are anti-notifications because they do the opposite of actual notifications. NOT_ifications tell you when nothing’s happened. NOT_ifications alert you to non-events. NOT_ifications encourage you to just carry on with what you were doing, rather than get distracted and start doing something else. NOT_ifications aren’t very fussed about productivity or timeliness or whether one thing is more important than another. NOT_ifications are not notifications. They’re what notifications are not. Bot platform: Cheap bots, done quick! Icon: The Noun Project.